"There's a way to dress pop-stars but there's a different way to dress royalty. There are certain codes and protocols to be respected." The Belgian Royal Family is without any doubt fashion-minded. Her Majesty Queen (formerly Princess) Mathilde was elected 'Most Elegant crowned head of Europe' by the leading magazine 'Vanity Fair'. On a regular basis Stijn Helsen receives members of the Belgian Royal Family at the Stijn Helsen (Concept) Store(s). "For Princess Claire of the Belgian Royal Family, i've created this jacket inspired by Dutch painter Piet Mondriaan. I replaced the typical Mondriaan colours with those of the Belgian flag and added a distinctive blue area as a metaphor for the blue blood. The result: neo-plasticism transposed onto a couture jacket with a ravishing effect." Princess Claire of Belgium procured a gorgeous jacket designed by Stijn Helsen that was inspired by the modernist artist Piet Mondriaan, a dress she wore on the Belgian National Holiday some time ago. Several fittings with princess Claire together with Stijn Helsen culminated in an expressive jacket with a three-quarter sleeve. The high-fashion piece that Stijn Helsen created, was inspired by Dutch painter Piet Mondriaan. He replaced the typical Mondriaan colours with those of the Belgian flag and added a distinctive blue area as a metaphor for the blue blood. The result: neo-plasticism transposed onto a couture jacket with a ravishing effect. 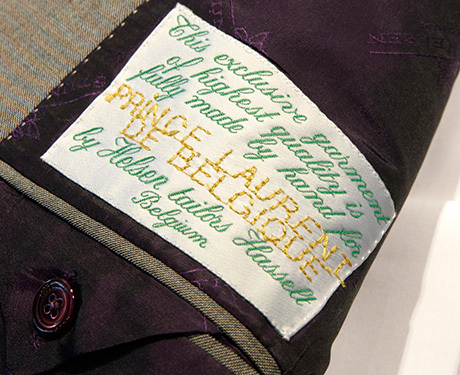 Prince Laurent of Belgium is a regular client at the Stijn Helsen Concept Store, especially for made-to-measure suits. It is not a secret that Prince Laurent of Belgium is quite an admirer of the style and approach of the bespoke creations of Stijn Helsen. Needless to say that in turn this is a enormous honour for the eager designer to count this crowned head of the Belgian Royal Family among his select circle of high-end clients. "The Belgian Royal Family is a regular client at the different Helsen stores, the Stijn Helsen Concept Store included. I guess you could say that to some extent they could carry the label Royal Warrants of Appointment. At least Helsen is a household name within the Royal Family."